Have you ever wondered why floodplains host such a variety of life? Why fishes tend to congregate in estuaries for spawning? Why humans have thrived for so long along floodplains? In nature ecosystems transition from one to another gradually as well as abruptly. I have gone into detail about the gradual transition of ecosystems in Across a gradient: How changing environment dictates community composition. Similarly, abrupt transitions also exist.These transition zones are extremely important from an ecological and economic point of view. They are very, very rich in biodiversity. Because of this richness and the fact complex conditions exist in this zone, it is vital for the economy of that region. In this post, I’ll take a look at the abrupt changes from one ecosystem to another. We’ll also see what these abrupt changes cause and how that is important for life in that region. These regions have faced great damage due to human activities. Understanding their dynamics is important if we are to manage them better in the future. When an ecosystem (or community) changes abruptly from one to another, that zone is called an ecotone. This is a fundamental characteristic of landscapes that is often studied by landscape ecologists. This zone can traverse long stretches along two ecosystems and is a place where characteristics of both ecosystems can be seen. Therefore, it makes for a completely different habitat! The read line represents the edge. Ecotones are created because of abrupt changes in environmental conditions. Plenty of examples exist in nature. The classic example of an ecotone is the transition from a forest to a grassland ecosystem. As the conditions of temperature and rainfall varies, you tend to see a slow change in the tree composition of the forest. Quite suddenly, the forest will give way to the open spaces of a grassland. The floodplain ecotone, also called riparian zone. Another example is that of a floodplain; a shift from terrestrial to aquatic ecosystem. The stretch of the bank where these two ecosystems meet forms one of the most important ecotones in nature. Ecotones are of such interest to ecologists because they are not only a physical transition from one ecosystem to another, they also represent a transition in the living conditions. That includes habitats and niches. Along this ecotone, organisms from both communities face increasing environmental stresses. For example, a deer (terrestrial animal) cannot live comfortable in an area that consists of wet marshlands (the ecotone between terrestrial and aquatic ecosystems). Similarly, the same deer will find it difficult to survive along the ecotone of a forest and a grassland because of lack of open spaces. It cannot keep a lookout for predators as effectively as it can in open grasslands. Deer at the edge of a grassland. However, the zone also represent an opportunity for other organisms. This opportunity is as a result of different living conditions in close proximity to each other. Diversity leads to stability in nature; with greater vegetation complexity and landscape elements, many different organisms can survive in ecotones. For example, terrestrial organisms will come towards the river bank to drink water. Birds often thrive in these ecotones as they get fish for food. Ecotones are harsh conditions for interior organisms but zones of opportunities for edge organisms. Since the ecosystem characteristics are so unique in ecotones, we also find a completely new array of species along this zone. Taking the river-land example again, we will find many amphibians and reptiles living along this ecotone. These animals will not be found in the interior zones of either ecosystem. Greater density in the ecotone. The greater number of landscape elements, vegetation complexity and mixed ecosystem characteristics result in greater density and biodiversity along the ecotones. This phenomenon is called the edge effect. For example, you will always find a greater number of bird species along the land-water ecotones. Similarly, the ecotones formed by seas and rivers (deltas or estuaries) have a greater number of fish species. The new array of species living along edges (which I mentioned above) are unique, and are called edge species. Amphibians are the classic edge species of floodplain ecotones. They are able to perform most of their daily activities along these edges. There are some species that are “edge species” for only a short period of time. Seasonal edge species are quite common in nature. For example, there are some species of fishes that come from the sea to estuaries for the spawning season. Sea turtles are also unique organisms that come into beaches to lay eggs, and get back to their sea habitat when their young ones are ready. Some other species are found in both edge as well as interior habitats. The squirrel is one such animal. This change in spatial and temporal habits of organisms makes the definition of an edge species quite difficult. Why are ecotones and edges important? Ecotones and edges are unique because of the conditions they host. Their ability to support so many different organisms make them highly sensitive areas for biodiversity. I mentioned above that these zones represent harsh living conditions. Therefore, even small changes in their characteristics can be potentially disastrous for the organisms living there. Humans have affected ecotones and edges massively in their quest to modify them for their benefit. These edges also represent advantageous conditions for humans, you see. Along the river-land ecotone, the land is extremely fertile. It also has a ready water source in close proximity. These conditions are excellent for the development of agricultural land. Why do you think great civilizations of the past were situated on floodplains? Human alteration along the Nile River. Our interference in interior ecosystems tend to create ecotones, in some cases. When a road is built through a forest, the path of the road represents a transition from the two forest ecosystems on either side. This artificial ecotone is also a tension zone for the interior organisms. For example, these “induced edges” play a detrimental role in seed dispersal of the nearby vegetation species. Our interference has added another dimension to an already complicated condition in ecotones. Nowhere in nature has excessive human involvement been beneficial for life. This same is the case for ecotones. Understanding ecotone-dynamics help us understand how we are affecting them. This will help us plan our land-use better in the future. Ecotones and edges are an active area of research for conservationists. If we can conserve and restore ecotones, we are effectively conserving a greater amount of biodiversity in nature. This was recognized when the Ramsar Convention was signed by 172 countries, vowing to protect the wetlands of the world. 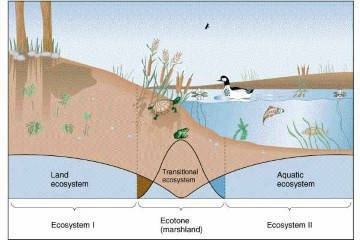 Wetlands form one of the greatest ecotone regions in the world. Today, so much biodiversity is being conserved and protected because of the decisions taken in that convention. Ecotones and edges will remain a huge are of research for future ecologists, because its development, maintenance and restoration is extremely important to support the huge biodiversity it hosts, as well as the sustenance of many economic activities. Yahner, Richard. H. 1988. Changes in wildlife communities near edges. Conservation Biology 2(4): 333-339. NextCoral bleaching: Is there a way corals can recover?